Towns That Are Creating Their Own Whistle-stops! The Bluemoonistic Team is always chasing trains and listening for whistles. Our latest photo shoot was at Old Fort, NC, where they are in the process of restoring their X-581 Southern Railway caboose. The former mayor of Old Fort, Bob Wilson, was instrumental in getting the caboose donated to the town by the Norfolk Southern Corp. in the 1990s. Unfortunately, there was a fire in the caboose in September 2017. The upside is the town is restoring it completely thanks to Rocky Hollifield (Craggy Mountain Line Railroad) who has been restoring train cars for over twenty years. When it is finished we will be giving you more photos! While there we visited the Old Fort Train Depot and Railroad Museum. The depot was built in 1892 and passenger service operated until 1975. It is a beautiful specimen of depots built in the nineteenth century. Glad the town was able to save and restore it. They have a small but interesting museum that includes artifacts, furniture, photos, signs and a replica of where the seven hand-dug tunnels were built across the Swannanoa Gap for the Western North Carolina Railroad. If they aren’t open when you go visit, just stop by the Town Hall directly across the tracks for a key. They will be more than happy to show off their museum! They also have a large room with a kitchen that is rented out for events. A win-win for the town! While in the area we checked out two other depots. The first stop we made was at the Marion Train Depot, the oldest depot in Western North Carolina, built in 1867. There was also passenger service at this depot until the 1970s. In 2005 the town of Marion with the assistance of the NC Department of Transportation restored the depot. It now houses their Office of Economic Development and has rooms available for rent for meetings and events. With multi-media equipment rooms that hold up to 150 people it is a perfect meeting space that is right downtown. They also have a lovely park surrounding the depot and have music at the Train Depot on Thursday nights during the summer. Next train stop – Black Mountain, NC. 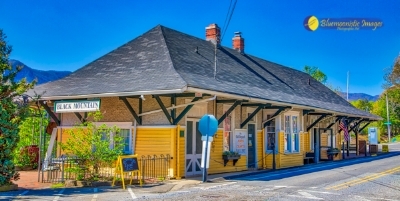 Their depot, which is also right downtown, has been restored by the Old Train Depot Association and now houses the Old Train Depot Arts & Craft Gallery! The gallery is filled with beautiful handcrafts by local artists. Their funds are used to support the upkeep of the depot and heritage art projects in the local schools. It was an amazing gallery and also contained train memorabilia throughout. When we were there we got to meet artist, Lenna G. Bucy. Her business is called “A Basket Case”, a name I love and perfect for a basket weaver. She also gave us a key to their caboose which is beautifully restored to period and can be viewed when the gallery is open. All three of these depots have been saved by their towns and have found new uses that benefit their communities economically. The nostalgia of railroads still runs strong today and it is great to see these beautiful structures restored. They benefit the towns in many ways whether it is for museums, event rentals or galleries. Each depot has a restored caboose next to it as well which also helps make them a tourist attraction. However, the depots themselves are really the revenue generators. Every local we spoke with was thrilled to have maintained a piece of their history. The trains may not stop there anymore but they have found ways to create their own Whistle-stops. What a great way to embrace their railroad heritage. We applaud their successes. In Black Mountain we were even able to get a few shots of a train going right by the station. We heard the whistle and ran with camera in hand. Yep, we chase trains!